Shopping for Snow White Statues? Snow White and Dopey are ready to dance! Disney Showcase statue spotlights Snow White and Dopey! Inspired by Walt Disney's Snow White and the Seven Dwarfs. Celebrate the 80th Anniversary of Snow White and the Seven Dwarfs by bringing home this colorful statue. Inspired by the classic Walt Disney movie Snow White and the Seven Dwarfs this is a must have for Disney fans. 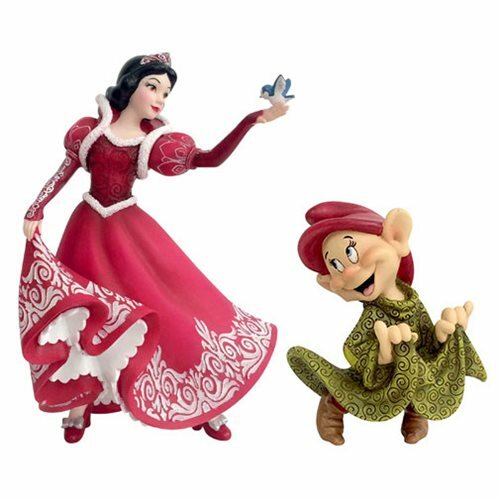 This charming statue features Snow White wearing a red dress and Dopey wearing his green outfit. The beautiful Disney Showcase Snow White and the Seven Dwarfs Snow White and Dopey 80th Anniversary Statue is made of stone resin. Measures about 8-inches tall. Ages 15 and up.